Discussion in 'Giveaways and Contests' started by khanyash, Jun 30, 2018. I would like to thank Mr. Aco from PC Trek for sponsoring the licenses for our active members. Version 1.0.1 ( yearly version ). Starting this version, the license now are on yearly subscription. PC Trek do not sell lifetime license now. Version 1.0.0 ( lifetime version ). It will work unlimited time as long as users don't update. If you update, the license won't work on the updated version. I usually only do copy/paste from a word processor but this I know is dangerous. The last password manager I used ate up all my passwords just like that eventhough I supplied the correct passowrd making m learn so bad and create another round of passwords That was work I want to win a license because from what I here Advanced Password Recovery Suite is the best there is and has support that can really help when you get into trouble unlike others that left you on your own. Advanced Password recovery suite covers all the areas i can think of for recovering important things like keys, passwords, usernames etc. I would like to win it so that I don't get frustrated after forgetting passwords, keys etc. Thanks a lot for the giveaway @yashkhan. Advanced Password Recovery Suite is a very good software for recovering lost keys and credentials for lots of important programs and games and various sites. I would be interested in winning a key for this software as i have a lot of software and using them all the time and this software helps me managing the activated keys. Advanced Password Recovery is a great program that is designed to recover passwords to encrypted archives. Thanks to this program, the user has the opportunity to access encrypted archives. Advanced Password Recovery removes even the most reliable password protection. Thanks for the giveaway @yashkhan ! Advanced Password Recovery Suite is an excellent software to be able to recover software lost keys and log in credentials. I'd like to win a lifetime license. Please count me in! 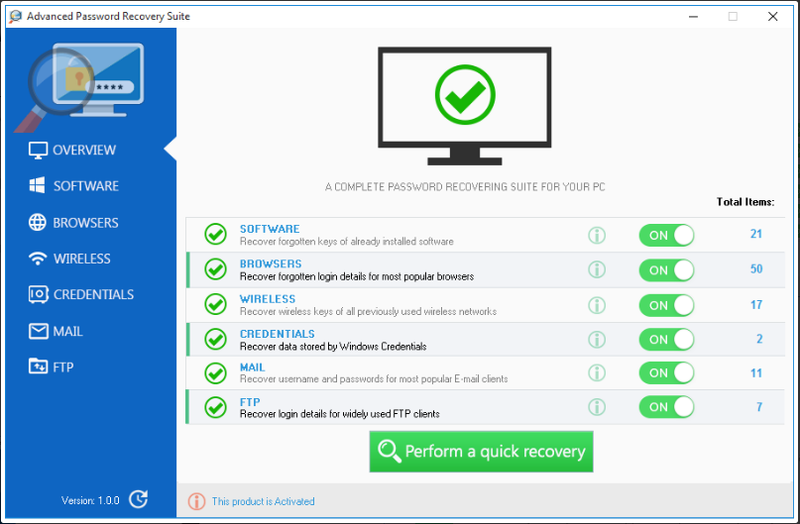 Advanced Password Recovery Suite is a complete password recovery suite that lets you easily recover lost software registration keys and login credentials. With Advanced Password Recovery Suite, you’ll skip right past workflow interruptions and be able to re-install and access Microsoft Windows, Office, AutoCAD, and over 1500 additional applications. Thanks to Yash Khan for this very good program giveaway & review article. I followed them on twitter, the share is above. Thanks for the giveaway, and I congratulate all the winners. Thanks for the license, Ya5h. Congrats to all the winners. Thank you for the license. Congratulations to all the winners!